The wing covering process is basically the same as the stabs only that you have a bigger area to cover. I won't go over the process again as you can read the Stab Covering explanation. Below is a gallery of photos showing the wings being covered. Like with most finish jobs, most of the work is in the preparation. It's no different covering models with film. For sanding the surfaces you'll need a few grades of sandpaper/wet & dry, some light weight filler, a clean soft surface to place your components on and some sanding blocks and last but not least, a tac rag. To get the alignment right, you will require some measuring tools. I used a B&Q laser (see picture below) which was purchased off eBay a number of years ago. I'm not sure if they are still available or not but almost any Laser with cross hairs should do the trick. I was told the self levelling lasers are not much chop with respect to accuracy. The B&Q is not self levelling but has three thumb screws on its base for fine adjustment. 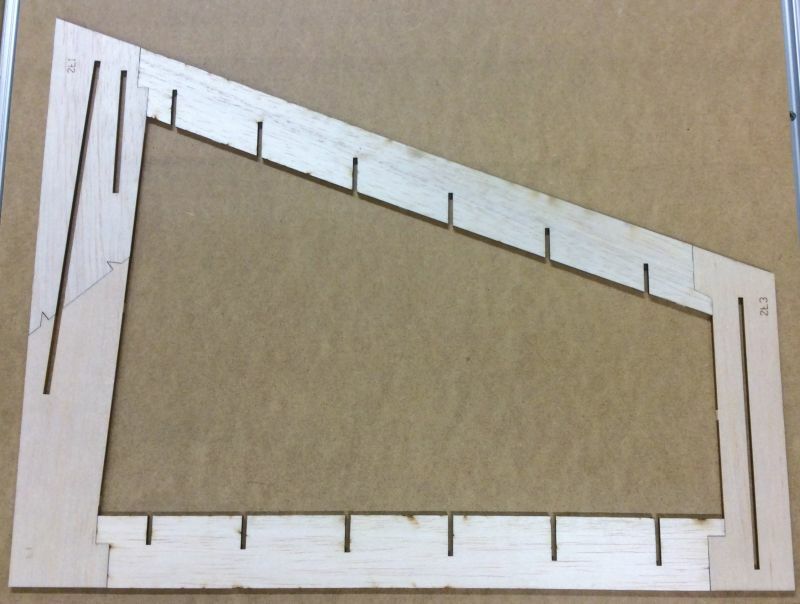 If you don't have a laser you could simply use a big tri-square (to align the fin) and an accurate level to perform the stab and wing socket alignment. The wing construction starts off the same way as the stabs. Firstly I cut out a couple of pieces of MDF upon which the wing will be built. Then the wing jig parts are prepared by gluing the parts to be joined together with CA. I used a straight edge to help keep the jig parts straight. The root and tip ribs are at 90 degrees to the trailing edge. Once again, marks were made on the MDF to help align the jig base. The stabs will be the first cab off the rank with this build. The MDF building boards have been cut to suit the stabs and are nice and flat. As each end of the jig is 90 degrees on the trailing edge, corresponding marks were made on the MDF with a Sharpie marker. This aids alignment prior to gluing with CA. Before gluing with CA, place some wax paper between the balsa and the MDF. We don't want the jig being glued to the MDF! Once you are happy with the alignment hit each of the five jig joints with CA and kicker. Then the wax paper can be pulled away from the jig. 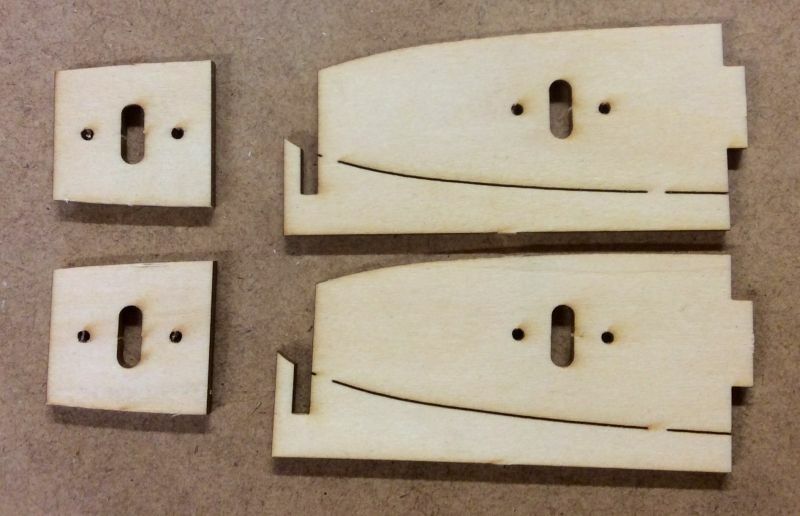 The ply parts have all been removed from the panels. I used a sharp scalpel to cut through the tabs from both sides of the panel and then each part is easily removed. The same was repeated to remove the waste material from each part. Take care not to break the jig section away from the wing and stab root ribs. As with pretty much any model construction, the accuracy or straightness of the finished product is only as good as the board or bench upon which it's built. That said, "do yourself a favour" and ensure your building board or surface is flat and straight. The dividends paid in a better flying model are worth the expenditure on a nice flat surface. For this build, I will use some medium density fibreboard or abreviated as "MDF" sheeting to construct each surface on and also for compressing the balsa sheeting onto the finished framework structure. 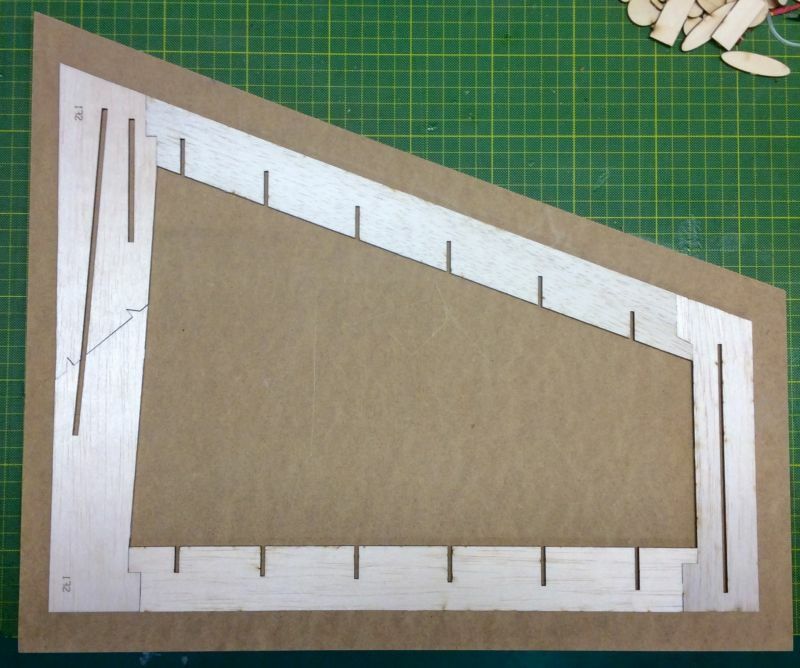 The MDF will be cut into sections a little bigger than the plan form of the wing and stab jigs. See photo below. This blog will detail the construction of the new Allure wing and stab kit. This kit has primarily been created to compliment the Allure Builders Kit offering but could also be used on the ARF version to reduce weight. The wing and stab is of course Bryan Hebert's design but the internal framework design was done by Mark Hunt. 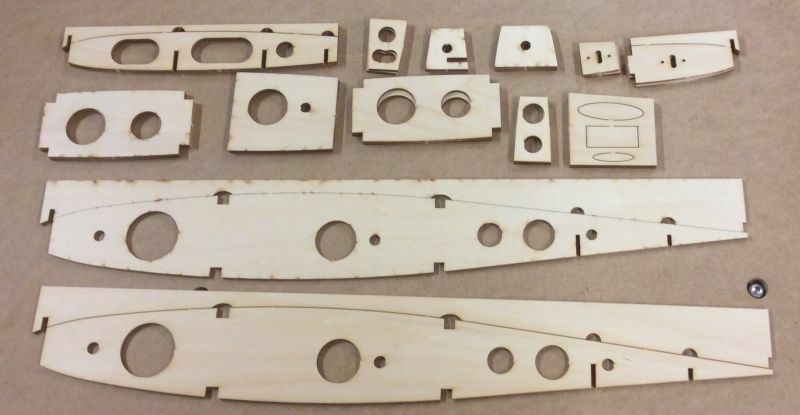 Mark has done a fabulous job of the design with all the parts locking into each other and also integrating the jig to ensure things are built straight.